This follows the old railway from East Grinstead, via Crawley Down, to Worth on the outskirts of Crawley, a distance of about 6 miles. Some photos and description of the old lines can be found on the Southern E-Group website. The route starts in the Railway car park, on the opposite side of the tracks from the station and follows the track bed of the old railway. The surface is reasonably solid and flat but can be muddy in wet weather with some patches of clay. It was Air Force Depot 227 and was requisitioned at the outbreak of the 2nd World War as a site for a fuel storage depot with huge tanks being sunk into the ground. During the course of the war fuel was distributed from it to a number of airfields including Dunsfold,Biggin Hill, Kenley, Gatwick. It has recently been sold and is now used by a construction company who have renovated some of the buildings and put them back into use. The track now runs straight for about a mile, until the Turners Hill to Worth road is reached at Compasses Crossing another old level crossing, here the Worth Way leaves the line of the railway. You have to turn left along the road for about 150m and then right along a bridle way. Eventually you pass a farm and come to a bridge over the M23 and into Worth by a small Saxon church. Here the Worth way becomes entwined with the urban sprawl of Crawley. As an alternative, you can start from the Station car park and go up the access road to Park Road then turn left and head West until you go over an old railway bridge and a road on the left. 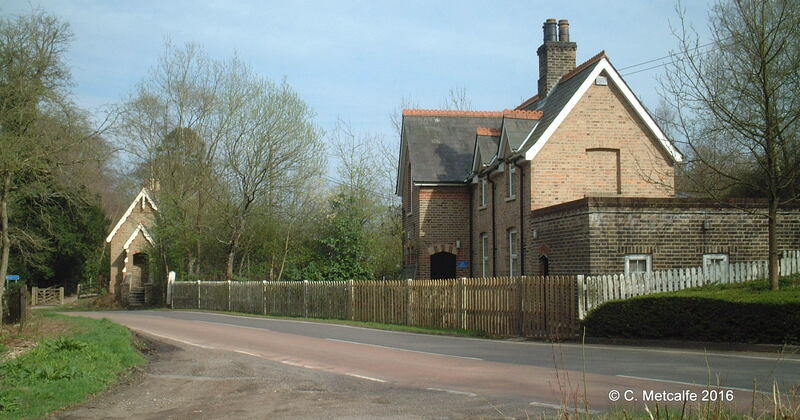 There is a Bridleway signposted between houses on the left. Turn into the Bridleway and follow it for about 1/2 mile until you come to Imberhorne Lane, just south of the school, go straight over and follow a farm track. Continue along past the first set of farm buildings until you arrive at Gullege, a rather quaint looking house. You can brave the bridleway which goes straight on, but gets very sticky when wet due to horses cutting up the surface. This leads onto the Felbridge – Crawley Down road about 1/2 mile outside Crawley Down. After a short ride along this road turn left into first residential road and you can re-join the marked Worth way. If you don’t fancy the mud then turn left at Gullege and you will soon find yourself on the Worth Way and can either return to East Grinstead or continue out to Crawley Down.